I am tired of trying to figure him out. I am tired of making him feel like something is “wrong” with him. I am tired of him thinking he is less than what I deserve. So from this day forth, I declare Owen… perfect. they are all part of who he is. I am sure as he gets older, medicine or other measures will be needed. He thinks that those best parts of life include me..
and until that changes, I am going to be a constant participant in living life with him. but I will always, always be his biggest fan..
shouldn’t be trying to “change” that person.. They should accept them just the way they are, and truely.. While moving some old blog posts over from one account to another, I came across this post. Owen had his appointment today. He fits the bill to a “T” for Aspergers Syndrom (a form of Autism). 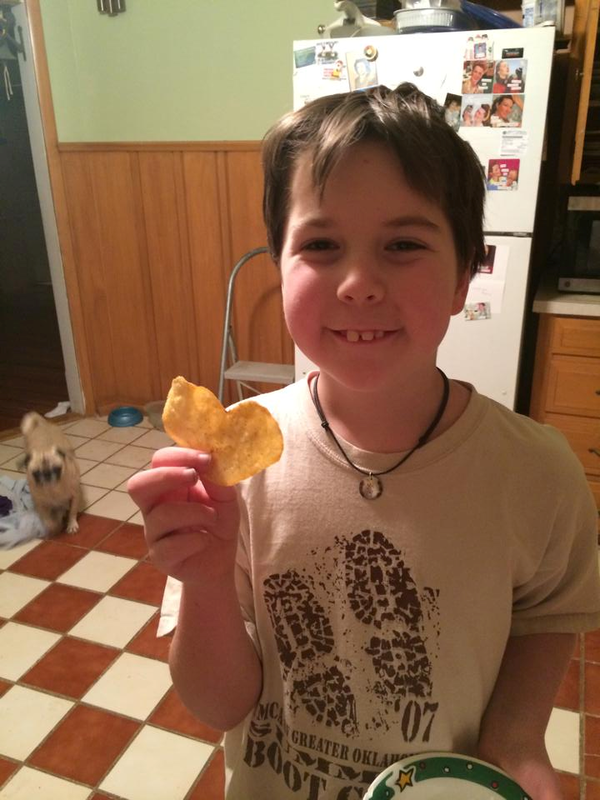 Test results show he has a moderate level of auditory and sensory perception disabilities. That all stem from this form of autism. This also helps explain his sleep disorder, immune system disorders and strange allergies…. We still have more tests, more doctors and a long list of meds and herbal remedies to try. We will get it all worked out. Daycare, meds, diagnosis, and relationships… it will all get worked out. I just really feel like my insides are hammered dog pookey, I have beaten myself up over this all day… I am exhausted and devistated. 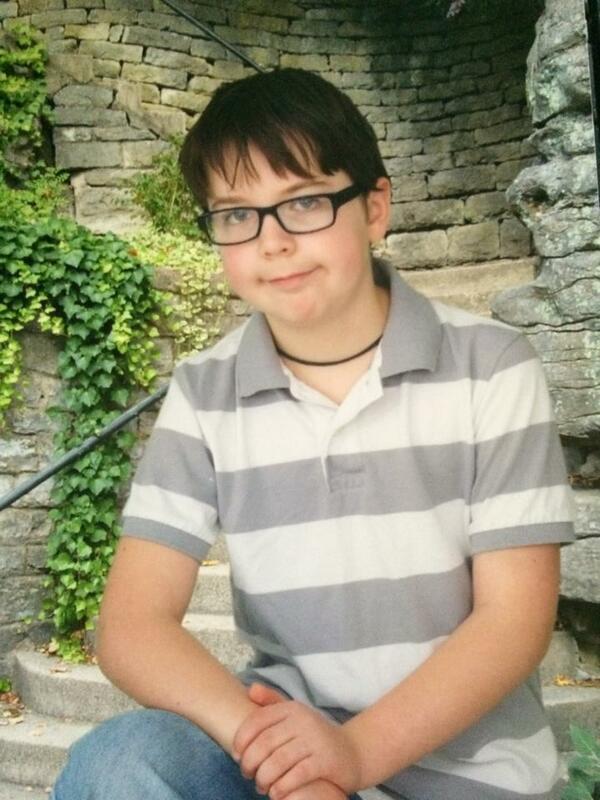 But I never though me sweet little boy, my sweet, sweet Owen….. would ever be anything other than perfect. And the mention of Auditory and Sensory Perseption disorders??!? !Whaat the Heck?? I don’t remember that! And that is what Dr. Saure first wanted me to check around November. I just found this interesting and a little eye opening. I received this info from a friend this morning. I MUST FIND HEATHER FISH!!! 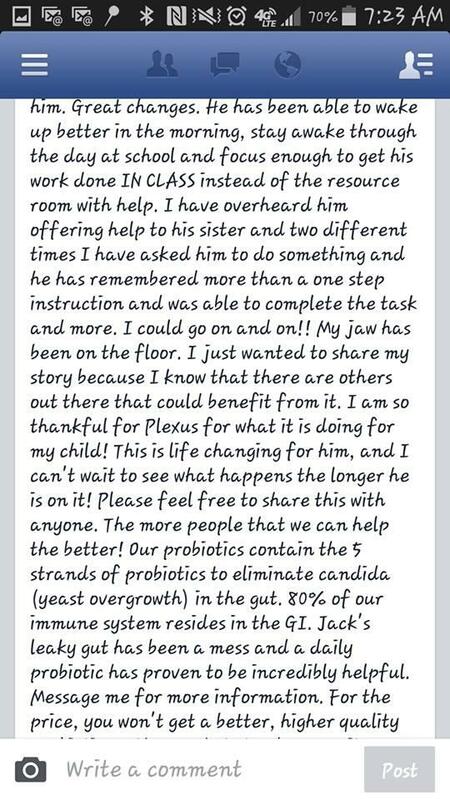 We are not strangers to the probiotic lifestyle. Actually, he is still on them. 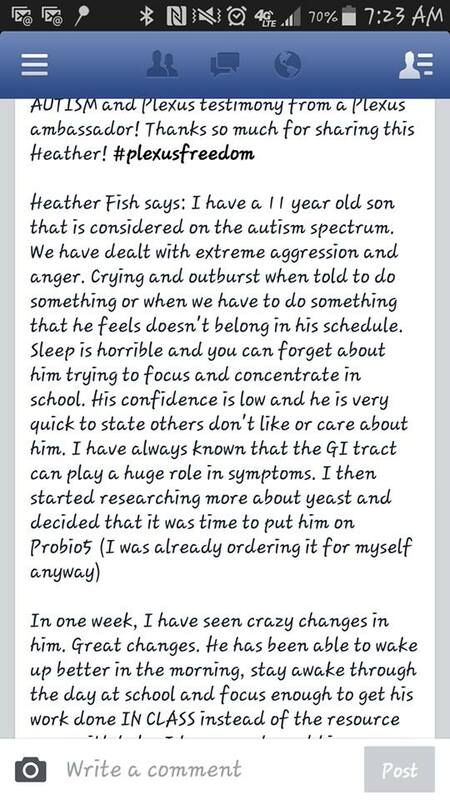 After his digestive yeast infection at age 3-4, we have had to stay on them continuously. It may sound strange to you, but between his gluten free diet and his probiotic pearls… his rages stay at a…. more manageable rate (?). With things getting worse and worse though, then getting some better with the upped dose of probiotics, makes me wonder if his “leaky gut” isn’t just becoming immune? I’m going to try this new kind, through Plexus, and see if it makes any difference. BUT… for the mean time… if YOU have seen this Facebook post and you know Heather Fish, OR know how to get in touch with her.. PLEASE, PLEASE, SHARE!!! I would love to follow-up with her and see what all else she is doing. Not Going to Lie, it’s not pretty…. I came across this picture on my Facebook last night that made my blood boil and my urge to run away, even stronger. Now, really, I do get it. I know that there are many, many special needs children out there with stuggling parents that need things like this to encourage them…to build them up, strengthen them and keep them going in this rewarding fight called “parenting the special needs child”. That’s where my problem starts. 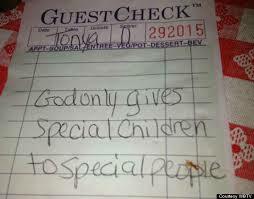 I know I call them “Special Needs”, but in reality my children have “Invisible” Special Needs. Mental Illness, they look fine on the outside… but are not fine at all… on the inside. Marissa has Bipolar Disorder, Agoraphobia, Anxiety and Psychosis… We are still trying to determine all of Owens stuff. “Maybe they are feeding off your own depression?”. “You just have to hang in there, chin up”. It seems, lately, the harder I try the worse all these efforts have been backfiring. I try to do something special with one or both of them and it always ends in disaster. I am always being pulled in several directions at once, I am forever walking on eggshells, I am constantly yelled at or talked mean to, misunderstood, ignored or belittled. I feel like I am living with an abusive partner, but in reality it is my kids. My children don’t have the kind of special needs that they have to have constant care and attention, but their needs are severe enough that they can’t be left alone due to individual fears, anxiety and inability to handle any type of emergency that may arise. I used to have my mom to confide in. She was the only person that knew my true inner struggle with parenting my mentally ill children. She was the only person that knew how hard I had to work to remain their gentle and kind punching bag and not turn into a bitter, angry, trembling mess. Mom was the one person that kept me from just running away from this whole messy life. Now she is gone. Mental illness is ugly. It changes people in so many ways. It is changing my son, slowly turning him into this surly, anti-social, angry, mean person. My one light spot in life is now lashing out at me. My daughter has abused me for so long I have become immune to her daggers, but my son’s word daggers are covered in a new poison… they sting just a little more, they burn just a little longer. I am in just a little more pain each day. Parenting is not for the weak, but parenting the mentally ill child is a whole other trait in itself… and I am weak, so very weak at times. I have my reasons for being so “vague” in my last posts. Sometimes it is to protect Owen, so he doesn’t have every piece of his life out there for the world to see and dissect. Sometimes it is to protect me, so my choices and thoughts are not out there for the world to pick apart and judge. When you have a child with “mystery symptoms”, it is easy to become overwhelmed, scared and paranoid that someone is going to think the worst and judge your decisions.. or even worse, turn you in for medical abuse. There have been so many cases in the news, just in the last 12 months, of parents being turned in by hospital staff due to their children having unexplained illnesses or “mystery symptoms”. Some parents were found out to be the actual cause of the childs illness and are rightly brought to justice. Some parents to be are found innocent and the child really ill, but still going through the pain and legal system that followed such accusations. I do NOT want to be one of those parents. My daughter was born with a congenital hip defect, her hip had formed out of socket. The pediatrician was suspicious of the “click” her hip made in the hospital the day after her birth. By the time she was two weeks old we were in the office of an Orthopedic surgeon getting things set up for her to wear a brace. She wore this brace for 6 weeks, then was placed in a full body cast for 4 months. At the ripe old age of 11 months, she had her cast removed and her hip has been fine ever since. During this difficult time, I was also in the process of finalizing my divorce and having to go to court for all the family law things this entailed. It was because of her cast that I was accused in court, by the Stovers, of Munchausen By Proxy, they claimed I had caused Marissa’s hip defect by abusing her in the hospital. When that didn’t work, they accused me of making it all up and having the cast placed “for attention”. The doctors were made to write a deposition and prove through medical records that this was a birth defect and NOT inflicted by any person. The full body cast put pressure on Marissa’s little tummy, causing her to have some digestion problems aggravated by acidic foods. For some reason, the other family kept insisting she eat baby food that had tropical fruit in it, orange juice and various other acidic foods. She would throw up on them, or cry nonstop during her visits, which always was followed with them accusing me of “making her sick” or “causing her to thow up on demand”. I underwent psychiatric evaluations to prove I was not Munchausen By Proxy. I documented every small detail of doctor visits, at home happenings, every fall, scrape, bump or bruise. The local Marshall was at my house at least 10 times to follow-up on their accusations. Try as they might they could never prove me an unfit mother, but the fear was set deep in my brain. The seed of fear had been planted. Now, I tell you this… not to make you feel sorry for me and what I went through at the hands of my ex-family. No, I tell you this story to show you that I am TERRIFIED to have to go through this again. The fear of having a child removed from my home and placed into foster care is my Post Traumatic Stress syndrome. Fear set in and almost paralyzed me, but because of Owen’s pain, I finally reached out and found Dr. Habersang who believed me, had Owen tested and confirmed our suspicion. Fear… fear is a huge factor in continuing with my search. I have researched to the point of exhaustion and happened on to an illness called Limbic Rage. (Episodic Dyscontrol Syndrome). It is similar to the HH I initially thought Owen had. It causes the same rages, same absence seizures, same strange fevers and tremors, same hot flashes and angry outbursts… all of it. It is in his limbic system, so usually a plethora of anti seizure medications are experimented with before the doctors may find one that helps on a minimal level. BUT… it has recently been discovered that Limbic Rage can be treated with, up to, 90% effectiveness with…. medical marijuana. I feel very strongly that I have found a possible reason for my son’s strange mysterious illnesses. I really think this is a possibility that needs to be explored, and once he has been officially diagnosed I can start getting him the medications and help he needs. I could even get a prescription and go buy my son some Medical Marijuana. It’s not legal in Texas, so I would be breaking the law. Fear is the paralyzing factor once again. How far does a parent go for her child? How much can I risk? So, there ya go. There is the deeper explanation on Owen’s illness diagnosis and what I have been trying to handle and decide all in secret. If you have strong feelings about the use of medical Marijuana and wish to berate me, judge me and tear me apart.. do so in your own blog where I will not see it, Please. I do NOT need any more negative thoughts than what I already inflicte on myself on a daily basis. If you are a loyal “Stover Supporter” and feel that they were misrepresented in this blog, feel free to unfriend me and move on with the words “TWO SIDES TO EVERY STORY” stamped on your behind. It’s hard enough to be a parent, but when you add to your regular parenting emotions, things like depression, grief, worry, conflict, insomnia, financial struggles, doubts, fear, etc… well, lets just say it makes parenting that much harder. I have ignored blogging for several reasons, but just because I haven’t written does not mean I have done nothing to try to help Owen these past 8 weeks. I actually have been very busy. No, there is still no official diagnosis on WHAT is really wrong with Owen, which is frustrating seeing as I have spent 8 weeks consulting with doctors, speaking with psychologists, researching the internet, going to ARD meetings at school, gathering advice from parents all over the US, crying buckets and buckets of tears, having numerous heart-to-heart talks with Owen. However, after all this I have finally made some real and concrete decisions. I will NOT be putting Owen on medication for seizures, depression, schizophrenia or numerous other mental disorders they “suspect”. Not yet anyways. I do not feel my son should be a guinea pig, not at 10 years-old. Until they give me a diagnosis, or Owen shows a real need for psychiatric drugs, I don’t feel he should have to go through the side effects that these types of drugs can place on a body. He has been on 2 different kinds in the past that both altered his personality so terribly, I can’t bear to put him (us) through that again. There has not really been many changes in his symptoms, other than the fact that his absence and rage seizures are 80% better due to getting back on his super strict Gluten Free, Red Dye #40, Sodium Free diet. Which is a good thing.. very expensive, very restrictive… but good. So we will be sticking with that for now. I have also decided that Owen will not be returning to public school next fall. This decision was not made in haste, and it scares the BE-GEEEZES out of me. It still worries me the way his little arms shake and tremor uncontrollably and he still has terrible headaches, strange fevers, outbursts, and nose bleeds… but right now, we are just hanging on as tight as we can and calming down anxiety and fears more than hunting an actual diagnosis. As for me? I’m still trying to organize and improve my own mental health. No, in truth I am really just trying to keep my head above the waters of depression. I do know I need to be healthy in order to be able to help Owen… so I am going to be taking care of a few things going on in my head, for a while. As always I am requesting prayers and positive energy our way. We will get this all figured out someday, until then…Thanks so much my friends!